Ayur Sanctuary - We correlate Ayurveda, Homoeopathy, Nature Therapy, Yoga and meditation. 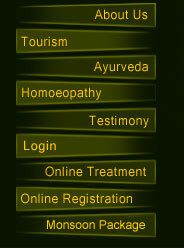 We are correlating Ayurveda, Homoeopathy, Nature Therapy, Yoga and meditation. We give special attention to sterility, Rheumatoid arthritis, Rheumatic fever, Vertebral column diseases, sports injuries, children's diseases, all types of hepatitis etc.